LG already has a large library. 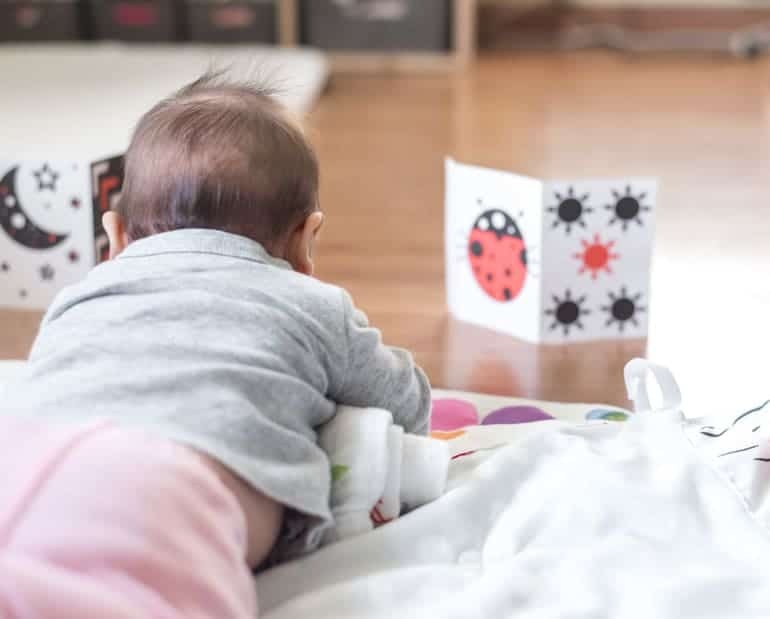 She has at least two dozen board books plus several less physically baby-friendly books of rhymes and stories for reading to her. Although many of the books have pictures she already enjoys studying, particularly the high-contrast Look, Look! and her Brown Bear, Brown Bear, What do You See? board book,we didn’t buy her many high-contrast books or cards because I wanted to design them, myself. 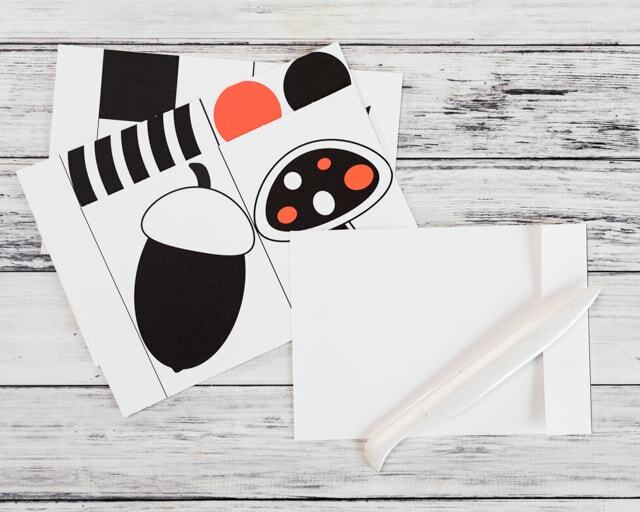 Today I’m sharing a set of free printable high contrast cards for newborns that can be made into “flashcards” or set up accordion style! 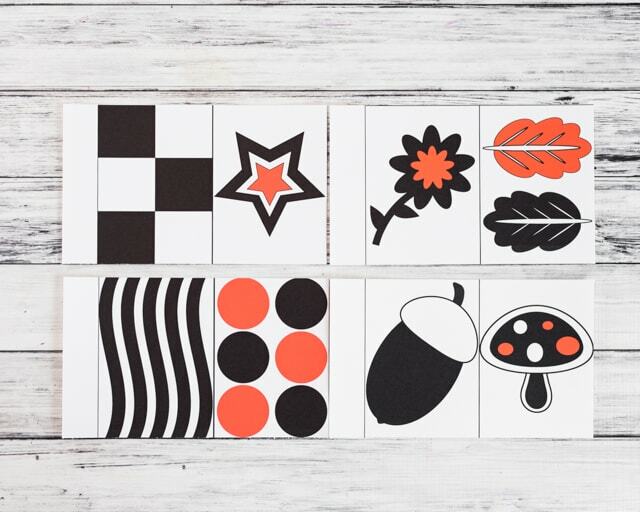 The high contrast patterns on these cards are bold, simple, and perfect for the very young ones. LG has enjoyed looking at hers pretty much since day one! They’re favorites during tummy time and side-lying time. You can either glue/tape sets of them together to make a long, accordion-style display or allow each pair to be independent and freestanding. Heavy duty cardstock. I used this 140lb cardstock. It’s a bit more expensive, but I purchased my pack over two years ago and still have a lot left. It’s really perfect for craft projects! Scissors or, preferably, a paper cutter. A “bone” folder. If you don’t have one, use the back of a metal spoon. Tape or glue, if you want to attach the card pairs to one another. Trim the cards. If you want to use them as individual ‘flashcards’ you can set up on an easel, tape to a surface, hang with magnets, etc, just cut out each one individually and call it a day. If you’d like to make freestanding pairs or an accordion, cut the cards as shown with a ‘tab’ on one side. Use your folder, or the back of a spoon, to fold the cards. 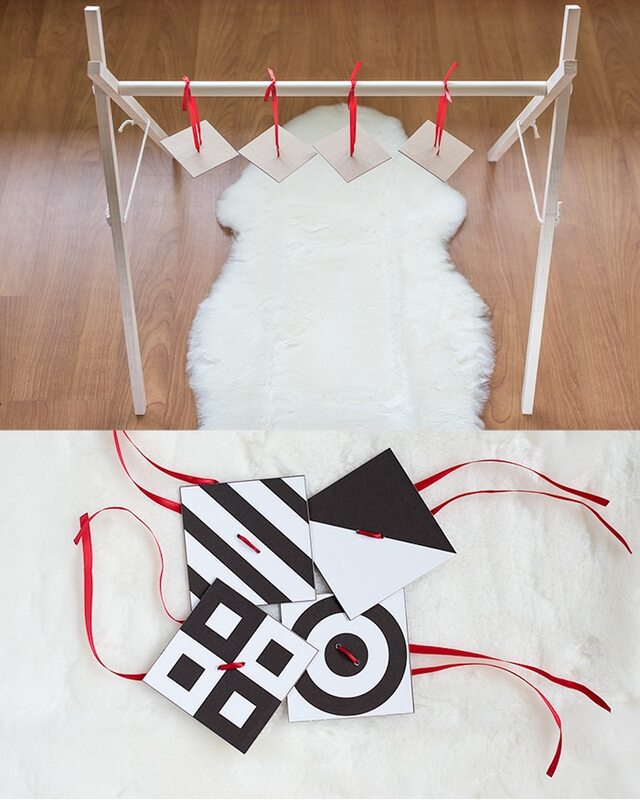 Fold the ‘middle’ line between the two designs and fold the tab. Put your adhesive of choice on each tab and stick it to the back of the neighboring set of cards. I chose not to permanently adhere the cards to one another so the cards are easy to reposition to encourage LG to look at them. They’re great during tummy time and side-lying time. You can also set one up where Baby can look at it while being burped or changed. It’s so much fun to watch them really absorbing everything they see! 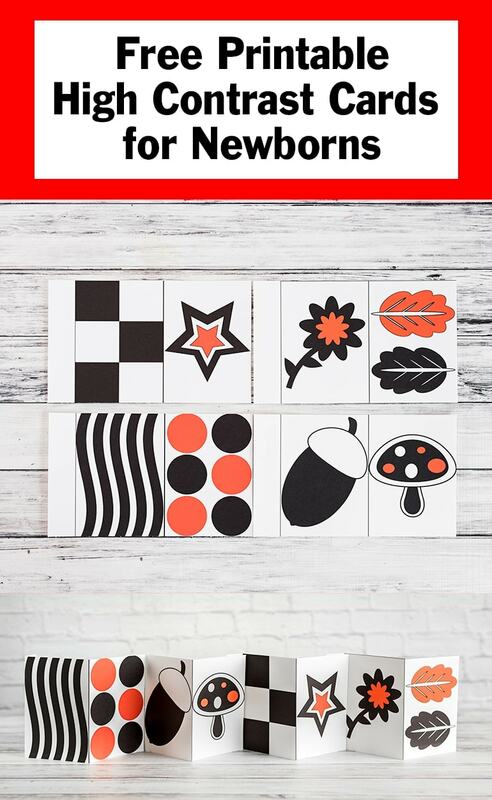 If you’re looking for more high contrast printables for newborns, please check out this post with square cards you can hang from an activity gym. 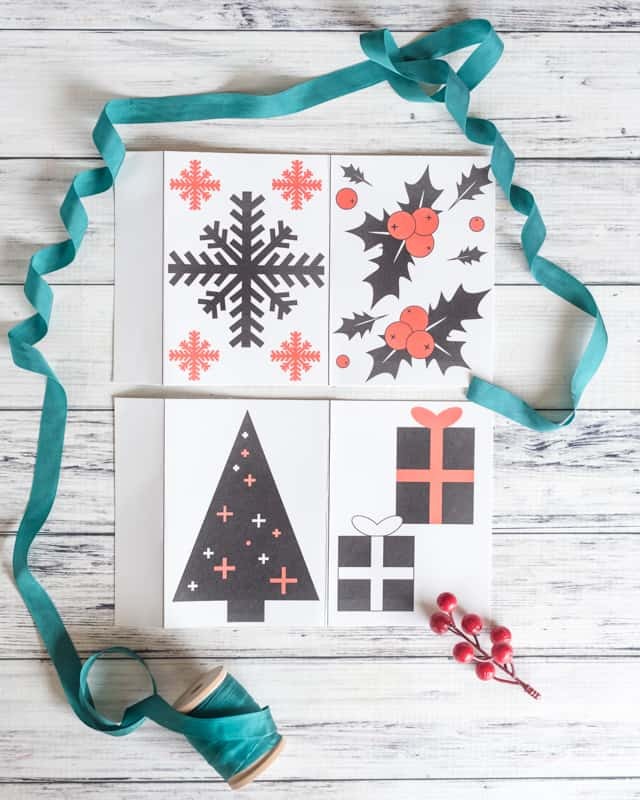 The printables are also free and the patterns are different from the ones given here! 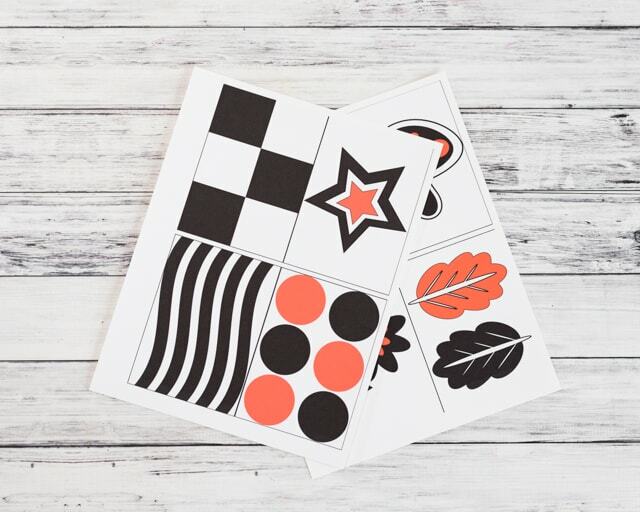 And these more complex high contrast cards for older infants! Are there any particular items you enjoy making for babies, whether yours or someone else’s?